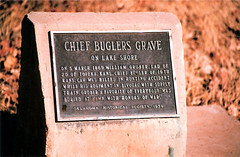 On 5 March 1869 William Gruber, Lad of 20 of Topeka, KANS., Chief Bugler of 19th Kans. Cav was killed in hunting accident while his regiment in bivouac with supply train. Gruber "a favorite of everybody" was buried at dawn with "honors of war." This is the grave site of William Gruber, the chief bugler of the Nineteenth Kansas Cavalry, who was accidentally killed on March 5, 1869, while the regiment was bivouacked nearby. * The marker as of 9/4/05 is not up. It was said to be located behind the Quartz Mountain Lodge next to a willow tree between the lodge and the lake. When they rebuilt the Lodge after a fire in February 1995, they took the marker down because of all the construction. The marker is believed to be in a storage room at the Lodge. Thanks to WY Man on Flickr for sharing this picture.